KIRKLAND, WA--(Marketwire - Nov 2, 2012) - Ceton, the world leader in digital cable tuner solutions for the PC, today announced an exclusive pre-order program with Newegg.com for the upcoming Ceton Echo Windows Media Center Extender. Starting today, consumers can pre-order the Ceton Echo at Newegg for $179 and receive a $10 Newegg Gift Card as well as free shipping. The Ceton Echo is expected to ship to pre-order customers by November 30, 2012 on a first-ordered/first-shipped basis. The Ceton Echo is a next-generation Windows Media Center Extender and the ultimate sidekick for a Windows Media Center PC. It transforms your PC into a multi-room entertainment device, bringing live TV, DVR* and digital entertainment to another TV set without requiring a set-top box. You can add up to five Ceton Echos to a Windows Media Center PC for a true whole-home entertainment experience, including DVR on every television set. If your Media Center PC includes a TV tuner that supports premium cable channels, like a Ceton InfiniTV tuner, you can use the Echo to watch channels like HBO®, Showtime® and Starz® from any TV set. The Echo even lets you enjoy your personal media libraries of photos, music, movies and videos from any Echo-connected TV. The Echo is compatible with Ceton TV tuners as well as non-Ceton tuners. "Millions of consumers around the world love using Windows Media Center to enjoy live TV, DVR and their personal media. They're clamoring for a high-quality, cost-saving way to bring those services to all their other TV sets at home as well," said Gary Hammer, president and CEO, Ceton Corp. "The Ceton Echo is the ideal solution for anyone who wants to enjoy the rich features of Media Center throughout the home, including whole-home DVR which most consumers can't get from their TV operator-provided set-top boxes. We're very excited to partner with Newegg to bring the Ceton Echo to market starting today." 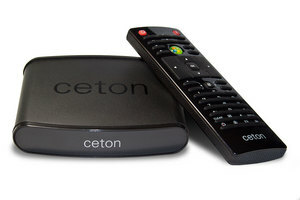 The Ceton Echo consumes approximately 90% less electricity than a high-definition cable DVR box or an Xbox 360 operating as a Media Center Extender. For the average consumer, that means using an Echo can save up to $60 a year in electricity per TV compared to a cable DVR or Xbox**. Using an Echo with a properly-equipped Media Center PC means you can also eliminate expensive set-top box lease fees and DVR "taxes." With lease fees typically costing more than $200 per year per DVR, the Echo can pay for itself in about 10 months. Combining the savings from set-top box lease fees and power usage means that, at the end of the first year, the Echo can have paid for itself and saved you up to $75 per TV! Ceton Corporation is the world leader in digital cable tuner solutions for the PC and is developing the next generation of in-home digital entertainment and communication solutions. Combining stellar hardware and software engineering capabilities with market-making technology, Ceton aims to help unlock the potential of the digital home to unleash a new generation of in-home connected entertainment and communication services. More information about Ceton and its solutions is available at http://www.cetoncorp.com.